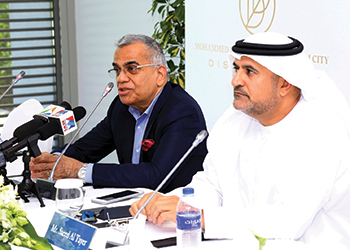 Al Tayer and Menon announce the new phase. Meydan Sobha has officially launched the latest phase of Mohammed Bin Rashid Al Maktoum (MBR) City – District One, the stunning new community adding another enviable living dimension to Dubai’s city centre. Located just 4 km from Burj Khalifa, in the heart of Downtown Dubai, Phase Three of the development offers potential homeowners a fresh wave of four- and five-bedroom freehold villas built on attractive larger plots, with a range of new floor plans including basement options, as well as an extended payment plan. “This is a hugely exciting project, and we are delighted to launch the newest phase of Mohammed Bin Rashid Al Maktoum City - District One, while reporting great progress on the first two phases,” says Saeed Humaid Al Tayer, chairman of Meydan Group. Phase Three is scheduled for handover in 2018. To ensure the 2018 handover date is met for Phase Three of District One, Meydan Sobha currently has more than 9,000 workers on site for the construction of the villas, with another 1,000 presently engaged in infrastructure works. To guarantee the highest quality control in all aspects of the construction, a team of 14 master-craftsmen were recruited from Germany. They include specialists in construction, mechanical electrical, plumbing services, and infrastructure. A joint venture project between Meydan Group and Sobha Group, Meydan Sobha has already sold out all villas in phases One and Two. Handover of both phases is scheduled for completion by 2017. Giving the community a unique waterfront dimension will be a 7-km Crystal Lagoon creating an idyllic manmade beachfront in the heart of the city, with lush green landscaping and a 14-km boardwalk. One project milestone has been achieved with delivery of the 8.4-km District One cycling and running track, while the Crystal Lagoon package has been awarded and construction is underway. With a total land area of 45 million sq ft, enclosed by green natural surroundings, District One of MBR City presents one of the lowest density villa developments in the heart of any international city. District One is also situated next to the spectacular Meydan One leisure, commercial, and entertainment destination in MBR City.